Hoping you all had a lovely weekend. We were busy working on all sorts of projects! 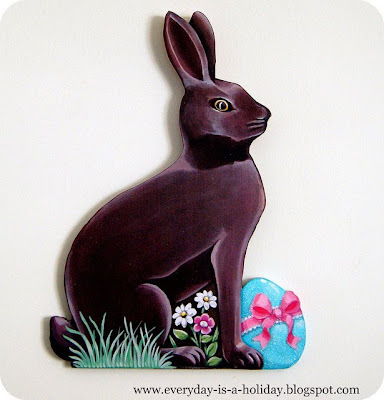 Finishing up some more diecuts (chocolate bunnies), putting the final touches on some upcoming workshops (so so excited for Art is..You), painting possibly my abbbsolute favorite new image to date! (just you wait! ), and a bunch of other things that seem to take hours and hours. Not that I mind spending my weekend on these things, I actually love it! Aaron and I find that even when we tell ourselves to put the paint brushes down and be "normal people" for the day, our brains go into overdrive...coming up with all sorts of new ideas and imagery! We always end up back in the studio! The only way to keep us from our art is to take us on a day trip! Even then..I will have a napkin or tiny scrap of paper in my purse with these totally ridiculous itty bitty overly detailed sketches ... I just have to get them out of me and into the world...even if it is only on a napkin! Here in our Everyday is a Holiday world Easter bunnies live right along side glittery hearts, and bottle brush trees all year round. 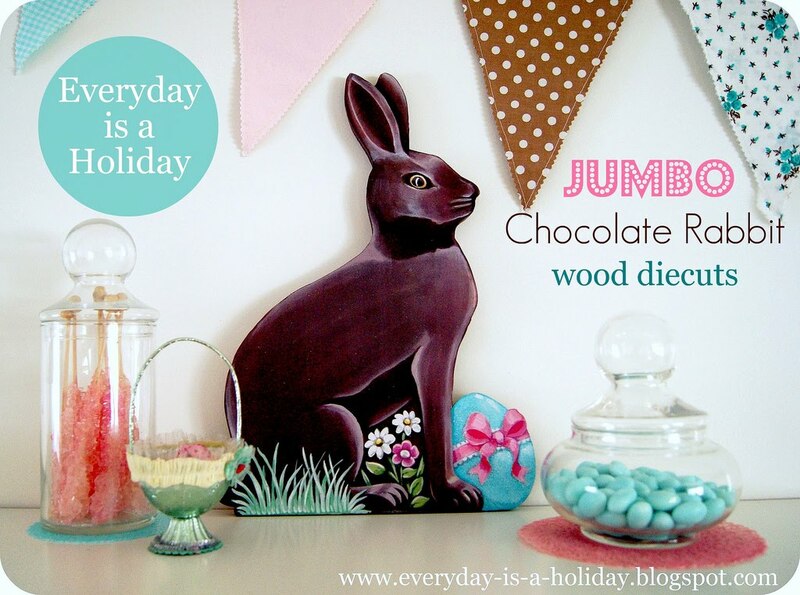 So you can bet a JUMBO sized Chocolate Rabbit will become part of the everyday family over here. Ok ok! I am just sooo beyond excited about Art Is You this year! Yes, it isn't till the fall, but we have been doing lots of planning and reworking, which has us feeling like it is right around the corner. Registrations will be opening soon soon! 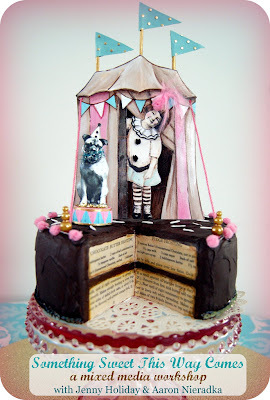 I posted these sneak peeks over on facebook and received so many lovely and excited comments! Thank you so much sweetpeas! We will be teaching the two workshops above. 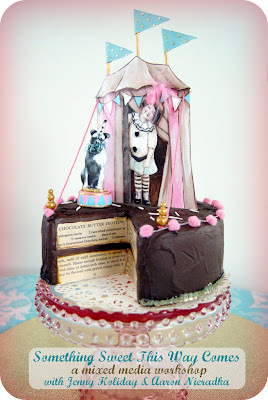 "Something Sweet This Way Comes" a very very fun mixed media assemblage, and yeah, that's a faux chocolate layer cake setting the stage for the adorable tableau on top. We had in mind a childhood favorite of ours...the Ray Bradbury tale: Something Wicked This Way Comes... which was made into a fave childhood movie... starring Jason Robards. I loved it and watched it obsessively! Scary yet magical...the parade through town when young Will and Jim hide in the grate beneath the street! 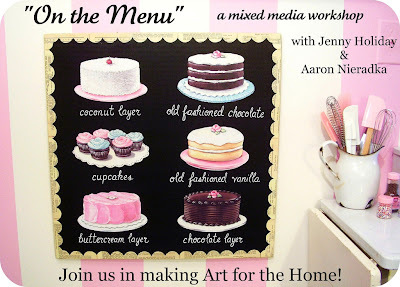 And in "On the Menu..." We will be creating fabulously sweet AND useful art for the home. Chalkboards... accented with vintage baking book pages...our original imagery... and plenty of tips and tricks for easy hand lettering...There'll be a few shapes and sizes to choose from. You can go strictly decorative or leave a bunch of room to make it a full function kitchen chalkboard. 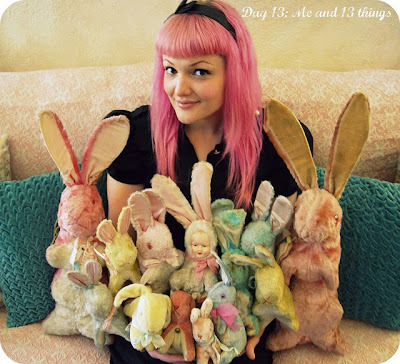 If you are looking for an incredible artsy getaway the place you gotta be this fall is at the Art is You Art Retreat ... like them on facebook for daily inspiration and a community of super friendly, open armed creative peeps. is that ur real hair colour? Such a cute chocolate bunny! Hi, you two! Sweet chocolate bunny. OMG! When I first saw the rabbit I thought it was a HUGE chocolate rabbit. I'm so glad it's has less calories... and ADORABLE! Congrats on the new collection of wall fun!